Thanks for all of your nice comments on my previous post. I do need to seek professional help; that much has been clear for over twenty years now. Perhaps this will be the year I enter therapy. Then I can say things like, "My therapist said..." and "Wait until my therapist hears about this!" or "Let me check with my therapist and get back to you." I'll let you know how that goes. Right now the only thing I can say is, "Why is it so hard to get a therapist to call you back?" In the meantime, I am throwing myself into projects. 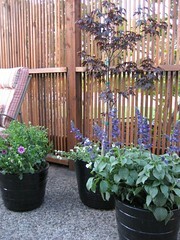 Today the kids and I went on a quick shopping trip to IKEA to pick up some ceramic pots for the patio. On a typical short visit to IKEA we skip the showroom section of the store and go straight to marketplace. This time we entered at the checkouts and swam our way upstream to the garden section. (I realize that what I'm saying will mean nothing to you unless you're a dyed-in-the-wool IKEA fan.) Anyway, we bought our pots and a few random items that found their way into our cart, got our frozen yogurt (the kids think it's ice cream! shhhh! ), used the family bathroom no less than three times, and finally left the place. Our next stop was Home Depot. I loaded the cart with as many plants as I could before Emily started complaining that the leaves were getting her. I threw in a bag of tiny rocks to use as drainage in my new pots, and we were out of Home Depot faster than you can say, "See you tomorrow when I come back to get some paint for the front door!" Once at home, I became the mad mom planting machine and managed to get all of our new plants in dirt, fertilized, and watered in time to make dinner before Mike got home. Damn, I'm good. Once I got going, the how tos of planting container gardens all came back to me: start with a large pot, add an inch or two of rocks for drainage, throw in a bunch of new soil, tap and squeeze the container of the plant to loosen the roots ever so gently, slide out the plant with root ball intact, put plant in new pot, add other new plants and more soil, keep soil loose and not compacted, sprinkle with some Miracle Gro, water deeply, and--voila!--shell-shocked plants that will most likely look better in a couple of days. It's nice to have the time, money, and energy to garden. I've missed it.